It's not much for today, but I found out that there's a chance of me taking CP Physics next year, as opposed to CP Chem like the rest of my classmates. Science at my school usually goes from Earth Science to Biology to Chemistry to Physics. Most people start with Earth Science their freshman year, and progress down the line like any other rat in the maze. Then there's the handful of smarty pants kids in each grade who did really well in 8th grade science, and therefor start Honors Biology freshman year. I've done my research. 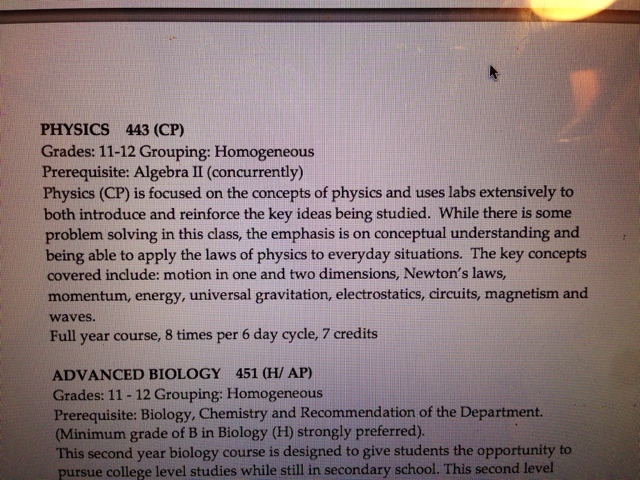 I don't see why I can't take CP Physics next year and just not take Chemistry. Considering that I'm planning on going into animation, special effects, 3D graphics and such, I think it makes sense for me to take Physics as my lab science, and use the extra time in senior year to work towards my art profile with art electives. Anyway, it's just nice to know that I've found a pathway out of the maze, and I can do my own thing. I just need to run this by one more person, and then I'm good to go. I was telling my grandma all about this, and how excited I was when I found out, and she said, "Way to go, Sonja! Make an executive decision!" Physics is so much fun! We decapitated barbies in my Honors Physics class!